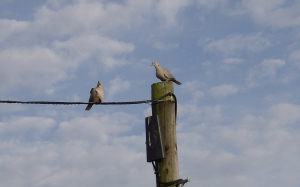 Observation - Collared Dove - UK and Ireland. Description: They were sitting on the pole looking out at the setting sun off Brighton & Hove. In reality I think they were waiting for us to move on so they could return to the rich pickings in the farmers field. They were sitting on the pole looking out at the setting sun off Brighton & Hove. In reality I think they were waiting for us to move on so they could return to the rich pickings in the farmers field.